On Wednesday 24th January, people from York and further afield, came together at the Minster’s Chapter House to commemorate the victims of the Holocaust. 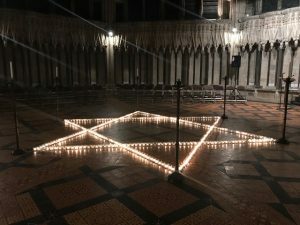 The event, named the ‘600 Candles Commemoration’ , was held as part of a series of events all over York to mark National Holocaust Memorial Day. The service included many poignant readings including letters from those in the Shoah, poetry read by a member of Middlesbrough’s refugee community, moments of reflection and a recital of the mourner’s Kaddish by members of York Liberal Jewish Community. This was then followed by an explanation of the Kaddish for the non-Jews present and how we can apply this not only to our own reflections about the Holocaust, but also the many tragedies and genocides now and since. The evening’s event followed this year’s Holocaust Memorial Day theme of ‘The Power of Words’, which was picked up again in the York HMD civil ceremony on Sunday 28th January held in York Library (Explore). This included contributions by York Central MP, Rachael Maskell, on ‘propaganda’ and the Lord Mayor of York, Cllr Boyce. It also included York Liberal Jewish Community’s very own Hannah Rich (aged 12), reading a passage written by our vice-chair, Lee Carter, who was one of the organisers of the week’s events.